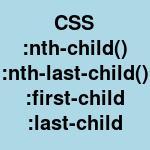 CSS nth-child, nth-last-child, first-child, last-child pseudo class selectors (:nth-child(), :nth-last-child(), :first-child, :last-child) are pretty powerful css selectors to create very useful styles in html. Here are some points to note about these pseudo classes. These pseudo classes can apply to any element like “div”, li, tr, etc. :nth-last-child() is similar to :nth-child() except that it starts backward from last child. This is probably most frequently use case. To have different style for odd/even child, the following example style can be used. We can use :nth-child(-n+2). Here for n=0,1,2,3, … expression (“-n+2”) value will be 2, 1, 0, -1, …. Hence it will match with first and 2nd child. Zero and negative values are ignored. We can use :nth-last-child(1) or last-child (without brackets). :nth-last-child() cound from last element. We can use nth-child(3n+1) for every third child starting from first.